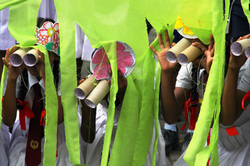 The Serendipity Trust offers rural schools the opportunity to participate in the Galle Children's Festival Outreach Program. The aim of these outreach events is to 'bring the Festival to the students' by offering a day of fun creative workshops within the school environment for schools who are unable to participate in our main Festival program due to their rural locations, . Our next GCF Outreach Event will be held in early September 2014 at a rural inland school in the Southern Province. Students will be treated to a day of performances and creative workshops, bringing colour, fun and excitement to what would normally be a typical school day. Stay tuned for more details on our next GCF Outreach Event!